This is one the 108 divya desams and a very popular temple situated in Tiruvanthapuram,Kerala. Nammalwar, one among the 12 Vaishnavite saints of the Alvar tradition, has composed ten hymns in praise of Lord Padmanabha during 9th century. 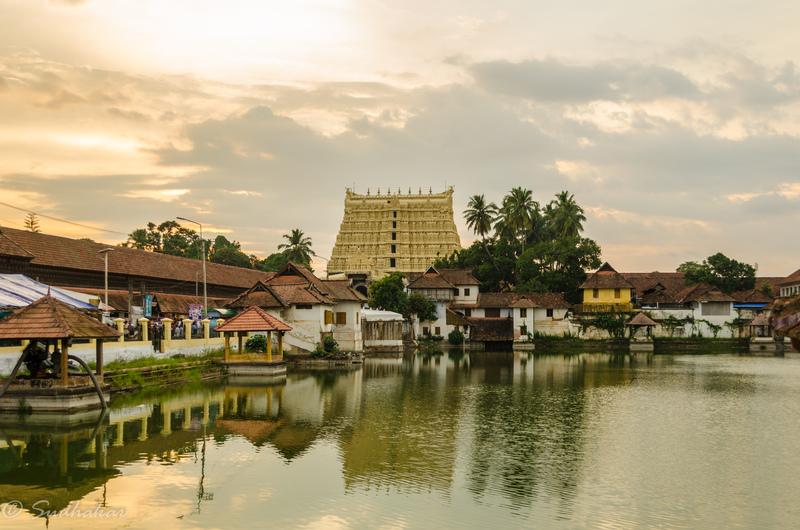 The origin of the temple of Sree Padmanabhaswamy could not be exactly determined from any historical documents as to when and by who the temple was constructed and by whom the original idol of Sree Padmanabhaswamy was installed and consecrated. The Temple has references in the Epics and Puranas. Srimad Bhagavatha says that Balarama visited this Temple, bathed in the temple pond,Padmatheertham. 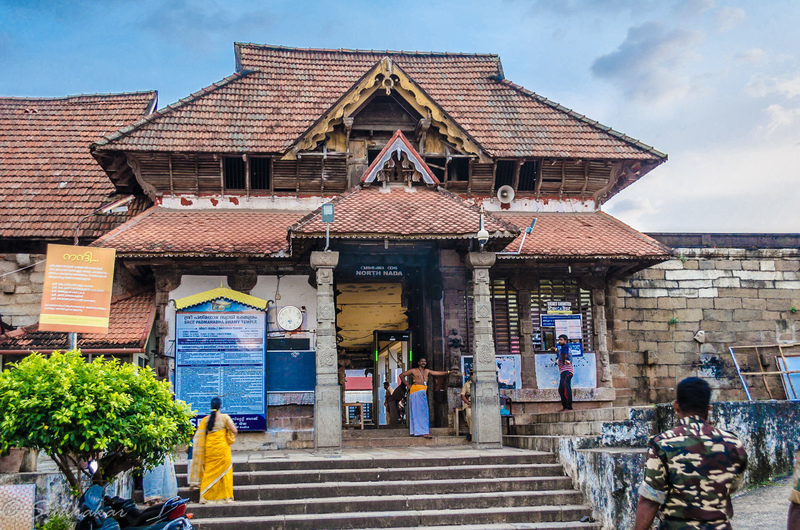 The temple is built in a fusion of the indigenous Kerala style and the Dravidian style of architecture associated with the temples seen in the state of Tamil Nadu. The temple very closely resemble that of the Adikesava Perumal temple located in Thiruvattar, Kanyakumari District. The Temple has nine entrances. The Temple has a seven storeyed gopuram built on the eastern entrance. It is a fine example of South Indian architecture and is about 35 meters height. On the top there are 7 golden 'kalasams' domes. The Temple has a marvelous praharam called Sreebalippura. This magnificent rectangular corridor built of stone surrounds the main shrines and it is through this corridor that the Vahanams are taken out during procession. The Ottakkal (single stone ) Mandapam is in front of the sanctum sanctorum of Lord Sree Padmanabhaswamy. This structure is built with a single slab of granite which is two and a half feet thick and twenty feet square. The Abhishekams to Sree Padmanabhaswamy are performed in this Mandapam. The granite pillars are covered with gold.Only the King of Travancore may get on to this platform to perform sashtanga namaskaram (prostrate) on this platform. As per tradition, anybody who prostrates on this mandapam has to surrender all that he possesses to the Lord. Since the King has already done that, he is permitted to prostrate on this mandapam. 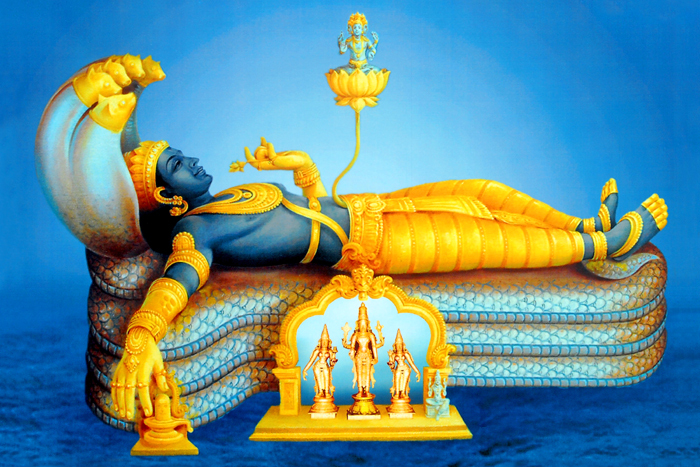 The moolavar Sree Padmanabhaswamy is seen in 'kidantha kolam' (reclined) on the mighty five hooded serpent Adi Seshan. The head positioned to the south and the feet to the north. Adi Seshan spreads its hoods above the head of the Idol.From the navel of the Lord, Brahma, is seen seated on a lotus. Below the stretched right arm of the Lord is a Shiva in lingam form. The sanctum sanctorum has three entrances representing the three stages of times. It is only through those doors that we can observe the Deity simialr to Thiruvattar temple.The face of the reclining Lord and Siva Linga underneath the hand is seen through the first door, Sridevi and Bhrigu Muni, Brahma seated on a lotus arising from the Lord's navel, gold abhisheka moorthies of Lord Padmanabha, Sridevi and Bhudevi, and silver utsava moorthi of Padmanabha can be seen through the second door.The Lord's feet, and Bhudevi and Markandeya Muni can be seen through the third door.The idols of Garuda, Narada, Tumburu, the divine forms of the six weapons of Lord Vishnu, Suryan, Chandran, Saptarishis (Seven Sages), Madhu, and Kaitabha are also there in the sannidhi. The Idol is made up of a highly complex amalgam and contains within it 12008 Salagramas collected from the bed of the River Gandaki in Nepal. It is believed that Salagramas represent Lord Vishnu. It is said that when twelve Salagramas are worshipped together it is equivalent for a Mahakshetram(Great Temple). The Ananthasayana Moorthy has several hundreds of Salagramams and the sanctity of a thousand Mahakshetrams. Thayar of this sthalam is Sree Harilakshmi. The Thiruvambadi Temple is within this temple complex. This sannidhi has a Namaskara Mandapam with fine display of carvings in wood. The idol of Sree Krishna as Parthasarathy is very beautiful, with one hand holding the whip and the other resting on the left thigh holding the conch. Restrictions and dress code Gents must enter the temple in dhoti without any shirt or vests. If you have not brought your dhoti, there are plenty of shops that can sell or rent you dhotis.Ladies should come in saree or half saree. Even Chudidhars are not allowed. The security checks are as stringent as you can see in airports, with metal detectors,body frisking,bag scanning. The temple is very strict in allowing electronic items such as mobile phones,camera,ipads,walkman,earphones. All the prohibited items are to deposited in the cloak room near the temple entrance. Even the shirts and vests removed should be deposited in the cloak room.The devasthanam designated cloak room does a good job of taking care of your personal items and the visitors need not worry. Photography is strictly prohibited near the vicinty. There are many festivals celeberated almost throughout the year.The following are some important festivals. 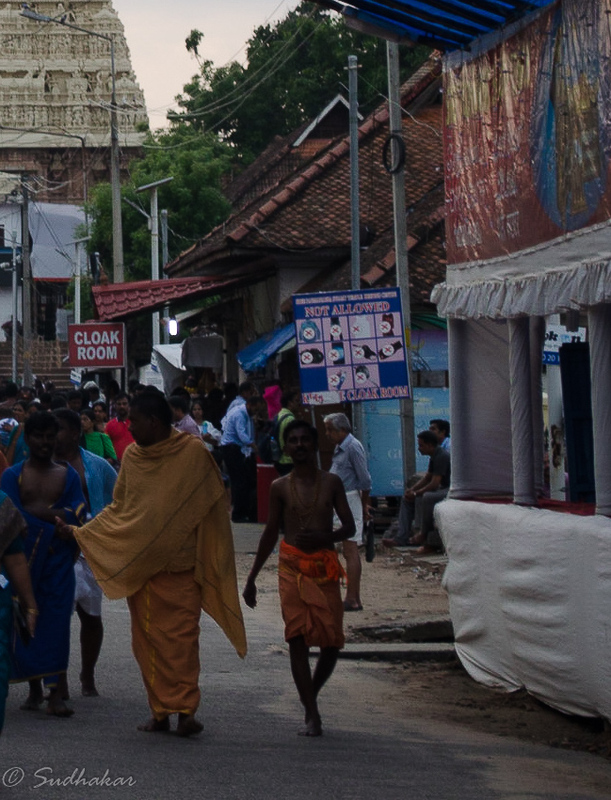 Thiruvonam is one among the most major celebrations of this Temple by virtue as it is the star birthday of Sree Padmanabhaswamy.The temple celebrates bi-annual festivals in the months of Thulam (Aippasi) and Meenam(Pankuni). The festival is of ten days duration culminating in the spectacular Palliveta followed by Arattu processions on the 9th and 10th days.The Maharajah of Travancore escorts the Aarat procession on foot.The utsavars of Padmanabhaswamy, Narasimha and Sree Krishna Swami are given a ritual bath in the sea. After this ceremony, the idols are taken back to the temple in a grand procession lit by traditional torches, marking the conclusion of the festival. A major annual festival related to Padmanabha temple is the Navaratri festival. The famous Swathi music festival is held every year during this festival. The biggest festival in this temple is laksha deepam, lighting of one lakh (hundred thousand) lamps. This festival is held once in 6 years. Prior to this festival, chanting and recitation of the three Vedas is done for 56 days (Murajapam). On the last day, hundred thousand oil lamps are lit in and around the temple premises. The next laksha deepam is scheduled on January 2020. How to reach? Thiruvanthapuram is the capital city of Kerala and has an international airport. It is well connected by rail from all over India. Where to Stay? There are many decent hotels at various budgets in the city. Places nearby Pazhavangadi Ganapathy TempleThiruvallam Sreevery near to Padmanabhswamy temple,Parasurama Swami Temple which is 3kms from the city,Attukal Bhagavathy Temple 2kms from Padmanabhaswamy temple,Neyyattinkara Sree Krishna Swamy Temple 20 kms south of Trivandrum on the way to Thiruvattaru are worth visiting. The world famous Kovalam beach is around 18kms from the city.